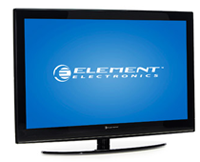 They're not known for high quality sets, but Element will soon be the only American-owned TV maker producing sets in the US. Element is a name you've heard of and one that likely make the lists of what not to buy. They're a company that imports inexpensive China made TVs and sells them at stores like Walmart. Things are about to change though, as Element is about to start manufacturing in the US. The company's new production facility in Canton, Michigan, will be set up to produce sets that are 46 inches and larger. The sets will still be the sort of budget sets the company is known for, and according to president and owner Michael O'Shaughnessy, they're not going to get any more expensive. O'Shaughnessy says that production costs are rising in China and considering shipping costs it's actually cheaper to manufacture large sets in the US. The company will be employing 100 workers in both assembly and in a new call center. Production will begin in March.